Explosions rip across the Earth-and all signs of blame point to OPTIMUS PRIME and the Transformers! G.I. JOE refuses to go quietly-and they assemble heroes big enough to stop the invaders! ACTION MAN and M.A.S.K. fight for humanity-but where do ROM and the Micronauts stand? 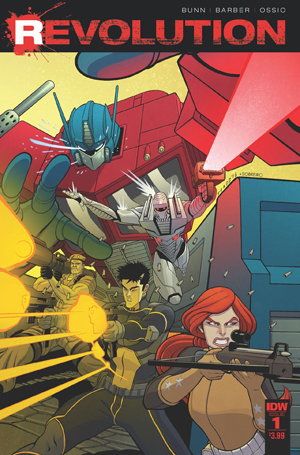 Celebrating more than a decade of stories by IDW and HASBRO, this unprecedented bi-weekly event draws everything together-and leaves nothing standing. The REVOLUTION is here-TAKE A STAND! FINAL COVER MAY VARY. ALLOCATIONS MAY OCCUR.